Minnesota state law requires medical facilities to report adverse events including surgical procedures on the wrong body part, wrong patient, wrong procedure and retention of foreign bodies. All hospitals in the State of Minnesota now have safety procedures in place designed to eliminate these complications. In an attempt to understand the impact of implemented safety procedures on errors in acute surgery, complications related to acute surgery are examined for hospitals in the State of Minnesota which contains three American College of Surgeons verified Level I trauma centers. Minnesota State database for adverse health events was queried from January 2006 to December 2007. Adverse events associated with acute surgical procedures in the emergency department and operating room were identified for all hospitals in the state. Seven adverse events for acute surgical procedures were identified in the emergency department or operating room of Level I trauma centers performing 77,310 operative procedures overall. Nine adverse events were identified in acute surgery procedures for hospitals which were not Level I trauma centers. In all, these hospitals performed 316,710 procedures. In acute surgical procedures, retained foreign body and incorrect operative site were the most common adverse events, each occurring in 44% of cases examined. 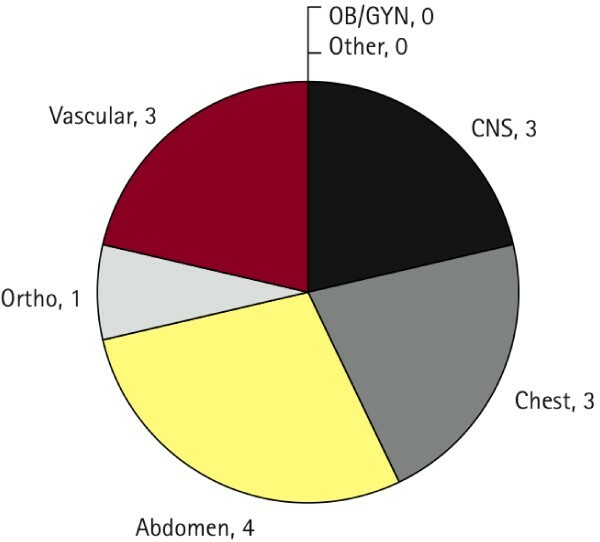 Anatomic distribution of adverse events related to acute surgery revealed that the majority of events were intraabdominal. When conformity to institution safety protocols was evaluated, noncompliance with internal guidelines was the most common problem (Figure 1). Performance of acute surgery is associated with a standard pattern of complications despite implementation of hospital-specific safety protocols. We need statewide data to understand this problem because adverse events are uncommon in individual hospitals. Reasons for failure to follow established safety protocols are still unclear.